This is a truly heavy duty builder’s barrow option in the steel tub that features a thicker tub wall, reinforced nose and heavy gauge handles. Features extra heavy duty steel tray which is commonly used by bricklayers and when shoveling loads or mixing materials together inside the tub, this is because the steel tray is more resilient to a shovel and more abrasive loads such as cement. They are suited to shifting materials such as: rocks, bricks, sand, tiles, pavers and concrete. Optional puncture free tyre is a must for the building site - no punctures & downtime ever again! Yard labour doesn’t have to be hard labour. Based on NZ Wheelbarrows LTD “Tradesman” barrow – NZ’s most popular wheelbarrow; the Yardlab Electric Wheelbarrow, fully loaded, will power up a steep hill and put a smile on your face. When travelling downhill, the motor brake charges the batteries. With a handbrake to stop, Yardlab’s Electric Wheelbarrow makes the job easier. Use by day, charge by night. Real Kiwi ingenuity from Kaitaia and built in Thames. · 48 volt, 500 watt hub motor with plug in charger. · Thumb throttle with variable speed. · Regenerative braking (charges while going downhill) and handbrake. 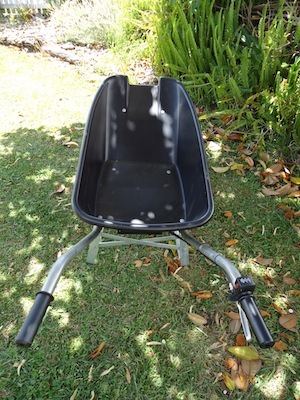 · Freewheels as a normal wheelbarrow with power when you need it. · Unit comes with six month conditional warranty on all parts. · Tare Weight of unit is 36kg. · Unit's Load Capacity is 100kg.